Uglyworld #1772 - That Didn't Workies - (Project TW - Image 349-366), a photo by www.bazpics.com on Flickr. Sometimes I thinks that some of you outs there in internets land can reads my mind, as my gooders buddy Tim suggestereds that Febreeze might does the trick on my smelliers hat. Littles did he knows that I alreadies had hatchereds a plan to tries justs that to rectimafy the situationer! 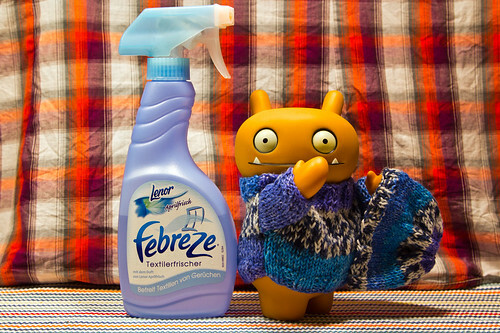 Unfortunatelies even with the bests wills in the world and a fulls bottler of Febreeze at my disposals my hat is still stinkiers after emptierings arounds half the bottler, so I thinks I has no options but to hands it over to Mireille for a proper washering. p.s. Baz teachereds me to holds my breath for a longers time, that's been the only way that I can holds the hat in my hands!